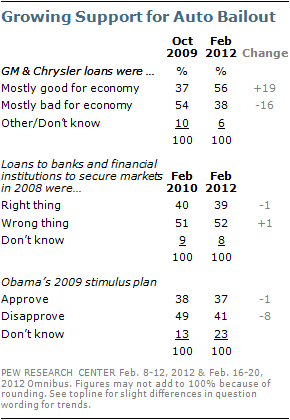 Public support for government loans to major U.S. automakers has increased sharply since 2009. Opinions are far less positive, however, about two other major initiatives to bolster the economy – the 2008 bank bailout and the 2009 stimulus plan. Americans also are of two minds when it comes to government regulation of business. While regulations are viewed negatively in the abstract, large majorities want to maintain or even strengthen federal regulations in food production, environmental protection, automobile safety and other areas. The latest national survey by the Pew Research Center for the People & the Press, conducted Feb. 8-12 among 1,501 adults, finds that 56% say the loans the government made to GM and Chrysler were mostly good for the economy, while 38% say the loans to the automakers were mostly bad for the economy. Opinion about the auto loans has reversed since October 2009. At that time, just 37% said the loans were mostly good for the economy while 54% expressed negative views. Republicans remain more skeptical than Democrats about the GM and Chrysler loans, but Republican support for the loans has nearly doubled since 2009 – from 23% then to 44% today. A majority of Americans (55%) say that the auto industry has a positive effect on the way things are going in the country; just 29% say it is having a negative effect. Far more say the auto industry is having a positive impact than say that about large corporations generally (28%) or banks and financial institutions (22%). However, the auto industry is not viewed as positively as small businesses (75% positive effect) or technology companies (70%). The survey finds that while the government’s loans to automakers are viewed more positively today than in the fall of 2009, there has been less change in opinions about other major economic policies. About four-in-ten (39%) say the major loans that the government extended to banks and financial institutions during the economic crisis of 2008 were the right thing for the government to do; 52% say they were the wrong thing. These views are virtually identical to opinions two years ago. The public is now divided over Barack Obama’s stimulus plan, which Congress passed in 2009. Overall, 37% approve of the legislation and 41% disapprove, while 23% express no opinion. Two years ago, 38% approved of the stimulus, while nearly half (49%) disapproved; 13% had no opinion. In terms of policy proposals currently under consideration in Washington, there is far more support than opposition for building the Keystone XL pipeline that would carry oil from Canada’s oil sands to refineries in Texas. So far, this issue has not resonated widely with the public; just 24% have heard a lot about this issue, while 37% have heard nothing at all. Still, among those who have heard at least a little about the Keystone XL pipeline, 66% say the government should approve the pipeline, while just 23% say it should not. Republicans are far more likely than Democrats or independents to have heard about the pipeline. Among those aware of this issue, 84% of Republicans say the government should build the pipeline, while just 9% say they should not. Independents, by greater than two-to-one (66% to 27%) approve of its construction. Democrats who have heard about the pipeline also are supportive – 49% approve of building the pipeline and 33% disapprove. The public has mixed attitudes about government regulation of business. Over the past year, there has been an increase in the percentage saying that, in general, government regulation of business usually does more harm than good – from 45% last March to 52% today. 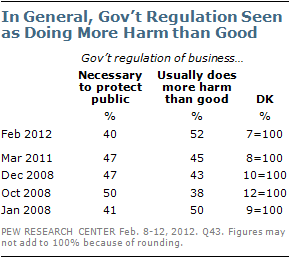 Four-in-ten (40%) say government regulation is necessary to protect the public interest. At the same time, there is little support for weakening federal regulations in specific areas such as food packaging and production, environmental protection, automobile safety standards, workplace health and safety and prescription drugs. 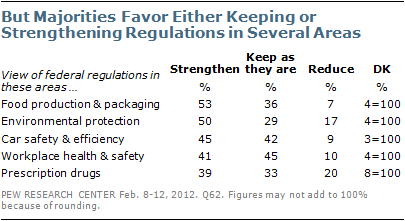 In each of these areas, large majorities say the federal government should strengthen regulations or keep them the same as they are now. For the most part, these opinions are little changed from 1995. 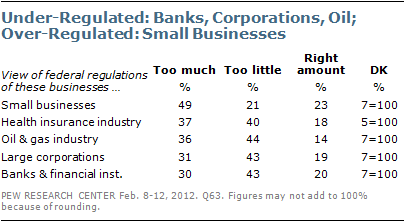 Moreover, the public does not see individual business sectors as over-regulated, with one notable exception. About half (49%) say there is too much federal regulation of small businesses, compared with just 21% who say there is too little regulation and 23% who say there is the right amount of regulation. By contrast, when it comes to large corporations, banks and financial institutions, and the oil and gas industry, pluralities say there is too little federal regulation. When it comes to the health insurance industry, however, about as many say there is too little (40%) as too much regulation (37%). There are sharp partisan differences over the level of federal regulation in each of the business sectors included in the survey. Majorities of Republicans say each is over-regulated, while Democrats are far more likely to say there is too little regulation. For the most part, independents are closer to Democrats than Republicans. For instance, comparable percentages of Democrats and independents say there is too little federal regulation of the oil and gas industry (56% of Democrats, 52% of independents), banks and financial institutions (50%, 54%) and the health insurance industry (50%, 48%). The survey also finds that the public is skeptical of the federal government taking a more active role in regulating how internet companies handle privacy issues. A 56% majority says the government should not do more to regulate how internet companies handle online privacy issues. Only about four-in-ten (38%) want to see the government become more involved in these issues. However, Americans do not have a positive view of the way that internet companies handle privacy matters. When asked about internet companies that collect personal information for targeted ads, 59% say this is an unjustified use of people’s personal information. Just 33% view this as a fair exchange for the free internet services– such as email, search and social networking – that these companies provide. The survey finds that the public’s views of the impact of major institutions and businesses have changed little over the past two years. Substantial majorities continue to say that small businesses (75%) and technology companies (70%) have a positive effect on the way things are going in the country. Colleges and universities (60%), churches (57%) and the auto industry (55%) also are generally viewed as having a positive impact on the country. By contrast, just 15% say Congress is having a positive effect while 75% say it is having a negative effect. Opinions about Congress’s impact have grown even more negative since March 2010 (24% positive, 65% negative). The public also remains highly critical of the impact of the federal government (66% negative effect) and banks and other financial institutions (68%), but these views have shown little change since March 2010.